Stretch marks can be a sensitive subject to talk about. They appear for mostly all pregnant women in the first few months of pregnancy. However, some people are turning this sensitive subject into art. As a result, a new demand for a more natural display of the human body is on the rise. 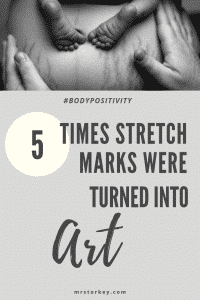 Here are 5 awesome examples of how stretch marks became art and generated an intense debate around the subject at the same time. Artist Cinta Tort Cartró uses her Instagram to display the natural “imperfections” of the female body in an artistic way. Her work took social media by storm and sparked an intense debate over all social media channels. Even mainstream hiphop which is not particularly known for feminist causes has joined the debate. Rapper Kendrick Lamar punched in some pretty strong lines about this subject in his hit single Humble. In it, Kendrick celebrates the natural body and criticizes the habit of editing out imperfections, so common in mainstream media. These reactions on Twitter show that mainstream artists can indeed make a difference when it comes to empowering the natural female body. 3) Super models have it too! Super models are usually a symbol of unattainable beauty standards. Modern technology has not made it better. The overly edited magazine photos not only misrepresent the models themselves, it also barely resembles a typical female body. At least this used to be the case. In a recent photoshoot featuring a U$ 3 million fantasy bra, Victoria Secret surprised the “body positive” movement by releasing a photo of model Jasmine Tookes which seems to have skipped the retouching stage. The result is stunning. Some people go all in and decide to art up their body marks with some ink. Check out this awesome list of some beautiful people who decided to embrace their body marks and make them shine. This awesome project aims to tell the story of real moms and their real bodies with the help of black-and-white pictures. Co-founder of abeautifulbodyproject.org Jade Bell offers private photos shoots in her studio in Tucson. You can find real mom stories divided by categories and even help to support their project. These are all great examples of how beautiful our real bodies can be. Celebrate yours. Whether you work to prevent stretch marks or just embrace them, your body is amazing in itself. The body-positive movement is here to stay.